The Institute of Rural Management Anand (IRMA), established in 1979 by the father of white revolution Dr Verghese Kurien, is a pioneering academic institution in rural management education and research. It is committed to pursuing excellence along with creativity and integrity. 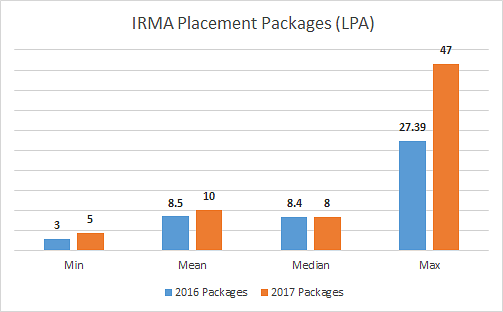 The unique strength of IRMA is its concern with integrating development and management in all its endeavours and activities. This perspective sets IRMA apart from other management and rural development institutions, which are largely concerned with either management or development but not both. Today, IRMA is recognized not only as an institution of excellence in teaching and research but also for having successfully created the new discipline of rural management. Its path-breaking approach is being emulated by other institutions in India and abroad. As a premier institution of professional education and development IRMA has evolved unique curricula for its various programmes. Post Graduate Programme in Rural Management is a two-year fully residential program. Basic eligibility required is a graduate from any discipline, with a minimum of 15 years (10+2+3) of education and having 50 percent or above (45 percent or above for SC/ST/DAP*) aggregate marks at the graduation level can apply for admission. All eligible applicants are required appear for the Common Admission Test. Applicants will be shortlisted for attending Personal Interview (PI) based on their overall performance in Common Admission Test and having cleared CAT Cut off. The Campus Placement Program for each graduating batch ensures that all the students secure meaningful and challenging career opportunities. The institute has enlisted over 750 partner organizations, which it invites for placement purposes. In the year 2016, 193 candidates participated in the placement process and in the year 2017, 169 candidates enrolled themselves for placement process.